Watching Anthony Chen’s Ilo Ilo feature at the London Film Festival last year I was struck by one of the film’s central tenets – if you subcontract out the parenting of your child to a babysitter or nanny, a person who by definition you actively want to form a strong bond with your child, does that diminish your role as parent in favour of their’s? 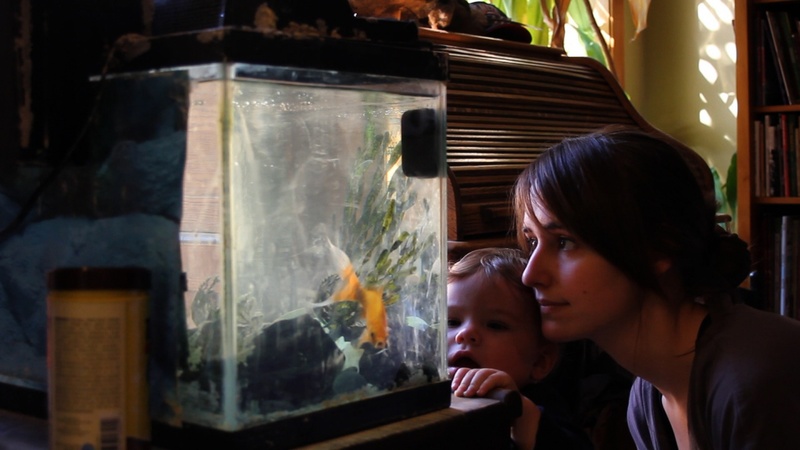 In his contemplative short Bridges, director Christopher Bell further explores the area as Joslyn Jensen’s (whose Without performance was a DN favourite of 2011) babysitter Elizabeth contemplates if life for her young charge would be better with her. We asked Christopher to take us through the development and production of Bridges. Originally the idea was for a feature: a slow-burn art film centred around two unrelated people that resembled each other, to be played by the Olsen twins. Their big comeback! I wrote up a collection of scenes and started working on an outline but soon decided that things were proceeding much too tidily for what was supposed to be odd and wild. However, one scene stayed with me – one of the characters was babysitting the other’s child and refers to herself as “Mommy”, tricking the infant. The baby then cries and the character apologizes profusely, trying to calm it down. Removed from everything else, this idea still engaged me. From there I tied it into feelings and thoughts I had about parenting and childcare: how people use children as pawns for their own desires, how they treat them as objects they can possess and keep, etc. I was also interested in child protection services and thought a babysitter could, on some level, symbolize that kind of institution within the script. One of the quotes that struck me was something given to case workers: “If a child is safe, leave it with the parents. If it is in danger, take it. If you aren’t sure, take it.” That really made me nervous for many obvious reasons. It also hit a personal side of me because I grew up with my grandparents, and while I had a happy childhood, it was still real life: people got angry, yelled at one another, and so forth and so on. What if someone caught us on one of these bad days? It’s a scary thought. I thought I had a substantial idea here and I was itching to work with Joslyn Jensen again. We had previously worked on a few school projects together and her skill really struck me. Together we made the first short I could actually be proud of, Bus Stop. I thought she’d be great for the babysitter. She agreed. So then the search for the actual baby had begun. We managed to find a friend from one of our jobs who was lax enough to let us use not only her baby, but her apartment too — a real blessing. Working with the baby (Julian) was great, but like working with animals, they’re pretty unpredictable. Still, I think it adds life and spontaneity to the project. Though he hit his cues pretty well (such as him crying in the first scene), I told Joslyn just to roll with whatever he did. Her character would stay constant and we’d do the scene as best as we could, but depending on his mood, she would react differently. It was a lot of fun and we got a lot out of it – the little guy really kept us on our feet. It took about two weekends to shoot and we used the now-classic DSLR cameras to shoot it (specifically the Canon T2i). Right now I am readying my first feature film, The Winds That Scatter, which will hopefully play at festivals in 2014.